As our plane began its descent, the rugged east coast of Tasmania was clearly visible. On the ship, the usual sights would have been Wineglass Bay, the spectacular Maria Island (which has the highest cliffs in Australia), Tasman Island, crossing Storm Bay leaving to starboard the formidable rock formations that make up Cape Raoul, before running free with a sea breeze up the Derwent Estuary. Airplanes do not give you quite the same atmosphere and feelings of the natural grandeur evoked when sailing past this piece of amazing coastline. Our first impression was that we had never seen Tasmania so dry - there was hardly a green blade of grass to be seen. Gill Allen had come across from UK to visit her sister Kate (Blackburn) who had worked on the ship in 1985 when we were filming of 'Taipan' in China.) and had spent a few days with us before flying down to Hobart. On our arrival at the airport, we were whisked away by David Bond, to show us his latest scale model of EOTW. It was quite eerie to see such a perfect scale model, on which he had obviously spent hundreds of hours to achieve such a wonderful result. 'Windeward Bound' was looking smart and Bristol fashion and open to the public. We were lucky to catch up with her Captain 'Sarah'. She is rigged as a brigantine and was built in Hobart. Some of the fittings aboard were salvaged from 'New Endeavour' when she was broken up in Ballina. She is now working on the east coast and does voyages of various durations. Overshadowing all was the superbly restored barque 'James Craig' who had experienced a textbook passage on her voyage down, running before strong nor'easterlies down the New South Wales and Tasmanian coast. We caught up with Ken Edwards, Commodore of the Heritage Fleet and Captain of 'James Craig' (who sailed with us around Cape Horn in 1991) as he was poised over the Derwent charts prior to sitting his pilot exemption so they could do day charters out of Hobart. There was a lot of interest in the smaller vessels as well, with many beautifully maintained and loved boats on display. Tasmania is the centre of Australia's wooden boat building industry, no doubt due to the excellent timbers that grew on the island, and are still reasonably available today. It was great to see a vessel with its home registration port being Faversham displayed on the stern - Keith and Maggie Stocks (who sailed with us many times to Pitcairn, Cape Horn and the Columbus voyage) had their replica of an east coast gaff-rigged cutter moored amongst the Tasmanian working boats. That evening was the first opportunity to meet with old crew and voyagers. We were lucky to catch up with Suzy Manigian who was down visiting from the Blue Mountains near Sydney. She could only be with everyone for one night, as she was off to look after wombats and Tassie devils for a week. Four of the five ex-owners of EOTW were there - Rodney Clarke, Lesley Reiter, Joe Spinelli - unfortunately Jean Dixon was unable to come. 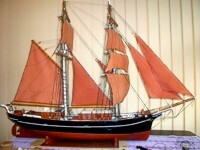 The initial dream of owning a sailing ship was formed in the early days aboard 'New Endeavour'. Present in Hobart from that 1966-1970 period was myself, Frank Walrave, Lesley Reiter, Joe Spinelli, Mike and Miranda Kitchenside, Tim Nossiter and Ted Mitchener. Saturday was busy with everyone catching up and running into old friends, dodging a few rain showers, and generally having a good time. On Sunday evening we had a soiree at Linda Kirkwoods home, which was enjoyed by everyone, and a great opportunity to have some quality chat time. Anders, who is an old friend from 'Eolus' days was also down and some of the Dufyken crew. Unfortunately Gary Wilson could not make it, as he was down on a supply vessel to the Antarctic. Of course, there was a lot of talk about the old days and old friends, and then the thought of hopefully maybe chartering her in 2011 for the 100 year anniversary..... we shall see. In summary - a great time had by all, and everyone is looking forward to the next festival. Apologies if we have missed mentioning anyone (Well, this is SOFTware, we can fix anything at any time, if needed! - Ina).